In the time it takes you to blink, their wings can beat up to 200 times. They can fly forward or backward, hover, and even fly upside down. They reach speeds of 30 mph flying, 60 mph diving, and can change direction on a dime. If Hollywood made a stunt bird, the hummingbird would surely be it. 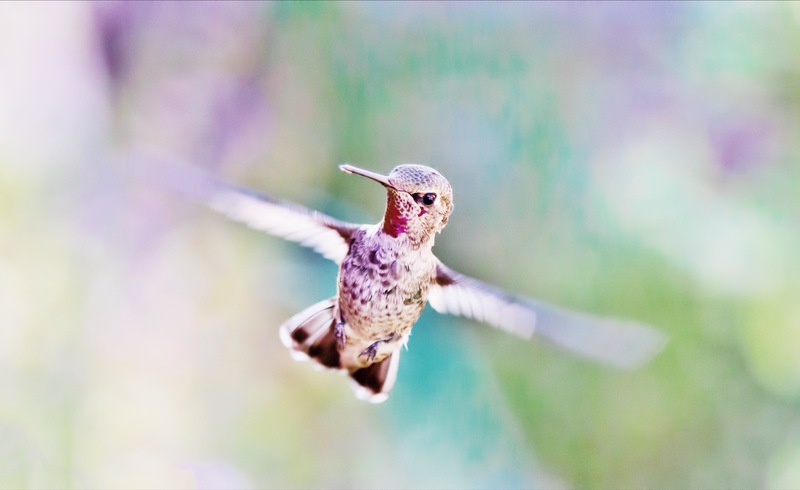 Tiny birds with a huge presence, the hummingbird gets its name from the humming sound made by their wings –– with different hums based on different wing speeds. The hummingbird’s long, thin bill and equally long, thin tongue are used to collect their main source of food: nectar. They are known as nectarivores, and ninety percent of their diet comes from flowers, with the other ten percent coming from insects –– a source of flying protein that they cleverly snap out of the air. Despite their tiny size, hummingbirds have a large appetite and eat about every 15 minutes during the day, a result of their fast heart rate and fast metabolism. If humans burned calories at the rate of a hummingbird, we’d have to eat about 77 times more than we do. Making it through the night without food means that hummingbirds go into a nocturnal hibernation, lowering both their body temperature and heart rate so they can sleep. Small but smart, hummingbirds have large brains. Studies have shown that they can remember every flower they’ve ever visited, migration routes, and even recognize the humans that fill their feeders; they know how long to wait between visits to the same flower for maximum nectar extraction; they use their beaks as weapons and are very territorial; and yes, hummingbirds are indeed the only bird that can fly backwards. Clever, stealth, and speedy, the hummingbird is a small-but-mighty masterpiece.